Se entiende por contaminación atmosférica a la presencia en la atmósfera de sustancias en una cantidad que implique molestias o riesgo para la salud de las personas y de los demás seres vivos, vienen de cualquier naturaleza,1 así como que puedan atacar a distintos materiales, reducir la visibilidad o producir olores desagradables. El nombre de la contaminación atmosférica se aplica por lo general a las alteraciones que tienen efectos perniciosos en los seres vivos y los elementos materiales, y no a otras alteraciones inocuas. Los principales mecanismos de contaminación atmosférica son los procesos industriales que implican combustión, tanto en industrias como en automóviles y calefacciones residenciales, que generan dióxido y monóxido de carbono, óxidos de nitrógeno y azufre, entre otros contaminantes. Igualmente, algunas industrias emiten gases nocivos en sus procesos productivos, como cloro o hidrocarburos que no han realizado combustión completa. La contaminación atmosférica puede tener carácter local, cuando los efectos ligados al foco se sufren en las inmediaciones del mismo, oplanetario, cuando por las características del contaminante, se ve afectado el equilibrio del planeta y zonas alejadas a las que contienen los focos emisores. ·Utilizados en los sistemas de refrigeración y de climatización por su fuerte poder conductor, son liberados a la atmósfera en el momento de la destrucción de los aparatos viejos. ·Utilizados como propelente en los aerosoles, una parte se libera en cada utilización. Los aerosoles utilizan de ahora en adelante otros gases sustitutivos, como el CO2. CH4, es un gas que se forma cuando la materia orgánica se descompone en condiciones en que hay escasez de oxígeno; esto es lo que ocurre en las ciénagas, en los pantanos y en los arrozales de los países húmedos tropicales. También se produce en los procesos de la digestión y defecación de los animales herbívoros. El metano es un gas de efecto invernadero que contribuye al calentamiento global del planeta Tierra, ya que aumenta la capacidad de retención del calor por la atmósfera. 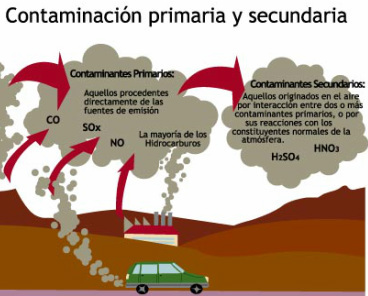 El ozono O3 es un constituyente natural de la atmósfera, pero cuando su concentración es superior a la normal se considera como un gas contaminante. Su concentración a nivel del mar, puede oscilar alrededor de 0,01 mg kg-1. Cuando la contaminación debida a los gases de escape de los automóviles es elevada y la radiación solar es intensa, el nivel de ozono aumenta y puede llegar hasta 0,1 kg-1. Air pollution means the presence in the atmosphere of substances in a quantity that involves discomfort or risk to the health of people and other living things; they come from many places.They can attack different materials, reduce the visibility or produce unpleasant odors. The name of the air pollution is usually applied to changes, which have devastating effects on living beings and the material elements, and not to other alterations harmless. The main mechanisms of air pollution are industrial processes that involve combustion, in industries such as automobiles and residential heating, generating carbon dioxide and carbon monoxide, nitrogen oxides and sulfur and other pollutants. Similarly, some industries emit harmful gases in its production processes, such as chlorine and hydrocarbons that have not performed complete combustion. · Used in refrigeration and air conditioning for their strong driving power, are released into the atmosphere at the time of the destruction of old equipment. · Used as a propellant in aerosols, a part is released for each use. Aerosols used henceforth substitute other gases such as CO2. The internal combustion engine cars emit carbon monoxide into the atmosphere so in highly urbanized areas tend to have an excessive concentration of this gas down to concentrations of 50-100 ppm, rates that are hazardous to health people. The concentration of CO2 in the atmosphere is rising steadily due to the use of fossil fuels as an energy source and it is theoretically possible to show that this fact is responsible for producing an increase in temperature of the Earth - greenhouse-The extent to this effect may change the global climate depends on the data used in a theoretical model, so that there are models that predict rapid and disastrous weather and other climatic effects that indicate limited. Reducing CO2 emissions to the atmosphere allow the total carbon cycle balance reached through the major carbon sinks such as deep ocean and sediments. Also known as nitrogen oxide (II) is a colorless gas slightly soluble in water produced by burning fossil fuels in transport and industry. Oxidizes very quickly becoming nitrogen dioxide, NO2, and then in nitric acid, HNO3, producing acid rain. The main source of sulfur dioxide emissions to the atmosphere is the combustion of coal containing sulfur. SO2 from the combustion of sulfur is oxidized and forms sulfuric acid, H2SO4 a component of acid rain which is harmful to plants, causing spots where acid droplets have contacted the leaves. Acid rain is formed when moisture in the air combines with nitrogen oxide or sulfur dioxide emitted by factories, power plants and vehicles that burn coal or oil. This chemical combination of gases with water vapor to form sulfuric acid and nitric acids, substances that fall to the ground as precipitation or acid rain. The contaminants that can form acid rain can travel long distances, and the winds move thousands of miles before plunging with dew, drizzle, or rain, hail, snow or fog normal, that becomes acidic when combined with these gases. SO2 also attacks the building materials usually consist of carbonate minerals such as limestone or marble, forming water-soluble substances and affecting the integrity and life of buildings and sculptures. CH4 is a gas formed when organic matter decomposes under conditions where oxygen is scarce, this is what happens in the swamps, in marshes and paddy fields of tropical humid countries. It also occurs in the processes of digestion and defecation of grazing animals. Methane is a greenhouse gas that contributes to global warming of planet Earth, as it increases the heat retention capacity of the atmosphere. O3 Ozone is a natural constituent of the atmosphere, but when their concentration is higher than normal gas is considered a pollutant. Its concentration at sea level can range from about 0.01 mg kg-1. When the pollution caused by exhaust gases from cars is high and solar radiation is intense, the ozone level increases and can reach up to 0.1 kg-1.